A group of talented hackers reverse engineer the controller/tablet, but don't expect to do it yourself anytime soon. One of the best features of the Wii U is the ability to stream your game straight to the gamepad, freeing up the TV. Of course, the obvious limitation here is that you're stuck playing Wii U games, which doesn't boast that large of a library at the moment. Now, a team of talented hackers have reverse engineered the gamepad so it can stream PC games. The hack was presented at this year's 30C3 hacker conference. Officially, the Wii U gamepad only works on the Wii U, so to break it free, they had to first understand how it works. The entire process is documented in their presentation (which you can find here). It's a fascinating puzzle, if you're into those things. Besides finding a way to connect to the pad in the first place, they also had to work out the non-standard protocols used for streaming the video, audio, and controller data. Suffice it to say, it was quite the piece of work. 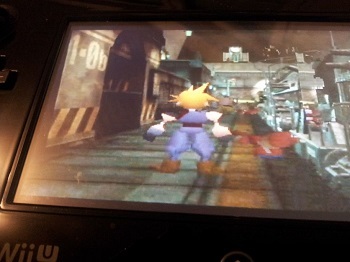 It's currently very much in the proof-of-concept stage, but eventually they did show Final Fantasy VII running on the device. In addition, they also released their work as open source, so you can tinker with it yourself (just don't expect too much yet). Perhaps with more work and time, it might be possible to (indirectly) run upcoming powerhouses like Titanfall and Watch Dogs on a Wii U controller, albeit at a 854x480 resolution.